Whether it’s your first or your latest addition to your family, you always want what’s best for your baby. And the safest 3place for your baby to sleep in is a crib. Manufacturers are all required to follow safety guidelines by the federal government. And a lot of cribs are even certified by the Juvenile Products Manufacturers Association (JPMA). Obviously, to ensure your baby’s safety, you’ll need to buy a new crib that complies with the latest safety guidelines. But which one of the latest cribs in the market is best for your baby? Well, don’t you worry. We’ve done the research for you. Check out our best baby cribs. Looking for a Versatility Baby Cribs? DaVinci is a popular brand because it is well-known for producing top quality cribs that are safe and convenient. Not only does this crib meet all the latest safety standards, it is also GREENGUARD Gold Certified – screened for 360 VOCs and more than 10,000 chemicals including lead and phthalates. The wood is made from sustainable forests. And you can be assured that this bed will grow with your baby over the years. More importantly, it comes in several finishes so you can find one that will fit your decor/theme. This convertible crib from Stork Craft is JPMA certified, with an adjustable three position mattress base support, a non-toxic finish, and a toddler rail for later conversion. The crib is also made up of solid wood that will endure many years of use, from a teething baby to a rambunctious teenager. If you want a small crib for your small space that is more than just a safe, secure place for your baby to sleep in, you might be interested in this multipurpose crib. Graco Pack ‘N Play Playard with Reversible Napper and Changer is compact, portable, and comfortable. It has a reversible station that can be used as a napper and changing table. And you also get a push-button folding system ensuring that packing it up for a trip will be easy-peasy. 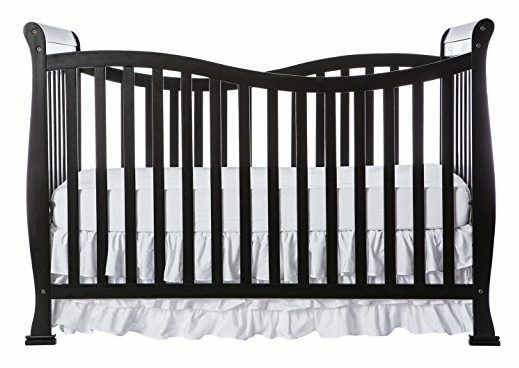 If you want a crib that will last a lifetime, from newborn to adulthood, then you might want to check out Dream On Me’s Violet 7-in-1 Convertible Life Style Crib. The crib can be converted into a toddler’s bed, a daybed, a twin bed with a footboard, a twin bed without a footboard, a full-sized bed with a footboard, and a full bed without one. Aside from this versatility, the crib has 4 adjustable height positions that will accommodate your baby’s growth and safety requirements. Also, this ergonomically designed crib meets the ASTM and CPSC safety standards and is free of phthalate, latex, lead, and BPA. A timeless design that will enhance the look of any nursery. Aside from the sleigh-style headboard, this JPMA certified crib has 3 height positions, a non-drop side design, and the toddler and daybed conversion kit. If you want a no-frills crib that will easily fit in your modern, sleek, minimalist theme/design that you have for your nursery, then you might want to check out this one. It’s an easy-to-assemble, lightweight crib that has 4 adjustable mattress positions that will grow with your baby. A mini crib is a perfect solution for a small nursery. And fortunately, a small crib doesn’t necessarily mean making do with less than stellar features. The Dream On Me 4-in-1 Aden Convertible Mini Crib is sturdily built with three adjustable height positions. It can be converted into a toddler day bed and adult twin bed, ensuring your baby sleeps in comfort as he grows up over the years. Only a handful of our top picks have the GREENGUARD Gold Certification and the DaVinci Jenny Lind 3-in-1 Convertible is one of them. Aside from being safe from VOCs, toxic chemicals, lead, and phthalate, this DaVinci crib also meets the ASTM international and US CPSC safety standards. And it’s made from 100% sustainable New Zealand pine wood. But what really makes it stand out (aside from its really classic design) is the four adjustable mattress positions. Most cribs offer just three. You even get wheels to help you move the crib around the house if necessary. Babyletto Hudson has a mid-century contemporary design that’s sleek, smooth, and stylish. Aside from looking really cool, the spindle sides offer you to stay cool about leaving your baby inside the crib. You’ll be able to view your baby inside the crib at any angle. And like DaVinci cribs, the Hudson has GREENGUARD Gold Certification and meets ASTM international and US CPSC safety standards. Similar to other DaVinci cribs on our list, the Jayden 4-in-1 Crib has GREENGUARD Gold Certification and meets ATSM international and US CPSC safety standards. In addition, this convertible crib is made from sustainable New Zealand pine. So, what makes it different from other DaVinci cribs? First, the design includes an elegantly curved headboard and curved sides. Like other convertible cribs on our list, this has 3 height positions, meets all government safety standards, and converts into a toddler bed, daybed, and full bed (parts sold separately). With the Graco Benton, you get a sturdy, solidly constructed bed for your baby that won’t put a huge hole in your pocket. If you and your baby are planning on experiencing the world, you may want to have a travel crib to ensure that your baby always has a safe place to sleep in no matter where you end up. It’s extremely light at 13 pounds and easy to set up (takes expert 90 seconds). Solid construction, machine-washable, and breathable mesh sides make this the best travel crib on our list. Aside from your arms, your baby’s crib is his most secure place. It’s his sanctuary, where he will feel comfortable enough to sleep and dream his days and nights away. Naturally, you’d want a crib that would not only be comfortable but extremely safe. With most cribs in the market today certified for safety by the federal government and JPMA, how do you know which one would be best for your baby? Well, we have the list above to help you out. But if you want to make your own choice, we’ve got a few tips to get you started. Make sure that your crib comes with all the necessary safety certifications from the CPSC (Consumer Products Safety Commission), ASTM International (American Society of Testing and Materials), and JPMA (Juvenile Products Manufacturers Association). Some cribs have even more certifications such as the GREENGUARD Gold Certification which ensures that the product was screened for more than 10,000 chemicals. Only a handful of cribs have this certification such as the DaVinci Kalani 4-in-1 Convertible Crib with Toddler Rail, Espresso, DaVinci Jenny Lind 3-in-1 Convertible Crib, and Babyletto Hudson 3-in-1 Convertible Crib. One of the most important features you need to consider is how high the rails of the crib will be. If you are short in stature, you may have difficulty placing your baby inside the crib if the crib has a height of more than 40 inches. The best crib we found that enables short parents to reach inside the crib easily is Union 3-in-1 Convertible Crib which is only 35 inches in height. To give you the most bang for your buck, it would be best to pick out a crib that would convert into a toddler bed and maybe even a full-sized one. Now, most baby cribs today are convertible. But one thing you must consider is how easily convertible is the crib and if the conversion kit is sold along with the crib. For example, the Delta Children Canton 4-in-1 Convertible Crib comes with both the toddler and daybed conversion kits for less than $200. Some cribs are easier to assemble than others. And this is an important consideration especially if you’re going to be building it all on your own. Cribs that are known for easy assembly include Graco Pack ‘n Play with Reversible Napper and Changer Playard, Graco Benton Convertible Crib , and the Dream On Me 4 in 1 Aden Convertible Mini Crib. You definitely do not want to end up with a crib that won’t fit in your baby’s nursery or your room. If you live in a small apartment, it’s best to consider a mini crib for your baby. We recommend the Dream On Me 4 in 1 Aden Convertible Mini Crib and Graco Pack ‘n Play with Reversible Napper and Changer Playard. Most cribs now have this feature, enabling you to lower the height of the mattress as your baby grows older to keep him or her safely tucked inside the crib. It is extremely important that the slats or rails are no more than 2 ⅜ inches apart. This is around the size of a soda can. Anything wider will result in your baby’s legs getting stuck between the slats. Here’s one last tip: never buy a secondhand crib. Safety regulations change over the years. While passing down a family heirloom seems cool, it most likely won’t be able to meet the safety standards set by the federal government. It might even contain lead paint. Your baby’s crib is one of the most important things you’ll ever buy for your little one. Taking the time to do your research and learning all the crib lingo will ensure that you get the best and safest place for your baby.